Lake Rescue Chalet is a large, cozy vacation rental chalet steps from Lake Rescue in southern Vermont, just minutes from Okemo and Killington ski resorts. The house can be reached by driving 4 hours from NYC or 3 hours from Boston. This comfortable six-bedroom chalet has a glorious outdoor hot tub to sink into after a hard day skiing nearby Okemo or Killington. With six bedrooms, two kitchens and two living/dining areas, there’s plenty of room for groups of up to 16. The private dock on Lake Rescue, a short walk up the road, has two kayaks and a canoe available for your use. The house is just 3 miles from Okemo’s Jackson Gore area and 12 miles from Killington’s Skyeship. Other nearby ski mountains include Pico, Magic Mountain and Stratton. Lake Rescue Chalet sleeps 16 people on two levels that each feature full open-floor-plan living areas – including a kitchen/living/dining room – and three bedrooms apiece! Upstairs and down are connected by a custom crafted wood-and-wrought-iron spiral staircase (with a child-safety gate at the top), and each level has its own bathroom, fireplace and large-screen smart TV. It's a terrific home for families and friends who want to spend time together but also cherish their privacy. They relax in the hot tub, barbecue on the huge front deck, watch the great blue herons that live just over the ridge, play volleyball in the yard, roast marshmallows over the fire pit or just nap in a hammock in the woods. The only thing that beats taking a canoe out on a misty summer morning is screaming down a ski slope after a fresh snowfall. WINTER: The snow is thick and the winters are cold in winter in Vermont-- perfect for skiing, snowboarding, sledding, ice skating, snowmobiling or just building a snowman. There are nine ski areas within 40 miles. SPRING: Flowers burst into a jumble of audacious color in May, and its reputation as Mud Season because of the snowmelt means you can escape to Vermont for bargain prices. SUMMER: Enjoy the Black River and 200-acre Lake Rescue, where we have a private dock with three boats – a canoe and two kayaks – a two-minute walk from the front door. There is boating, fishing, swimming and lounging on the dock in colorful Adirondack chairs. Several golf courses are nearby, as well as hiking trails, bike riding, historic sites, scenic New England towns to explore, shopping and more. FALL: Fall foliage season in Vermont means spectacular hiking, shopping, and breathtaking leaf peeping drives on scenic Vermont 100. 9% VT lodging tax, $200 cleaning and hot tub will be added to total rent, as well as a CSA travel insurance payment. A ONE-WEEK rental is required in July and August, Saturday to Saturday. FALL FOLIAGE season is also very popular and has a $200 surcharge for the weekend or week. IN WINTER -- Lake Rescue Chalet is just 3.5 miles from Okemo Mountain Resort and 11 from Killington Skyeship. It is available as a winter seasonal rental, or for winter weeks and weekends. We're a family of four who love the mountains and the outdoors. We lived in New York for two decades before relocating to Colorado, and we are now retired and traveling the world, while spending summers in Vermont. We get back to Vermont as often as we can! Our youngest daughter starts at Champlain College in Burlington in fall 2019. We love Lake Rescue Chalet because of its access to Okemo Ski Resort in winter -- just five minutes down the road -- and to Lake Rescue in summer for swimming, boating and fishing. 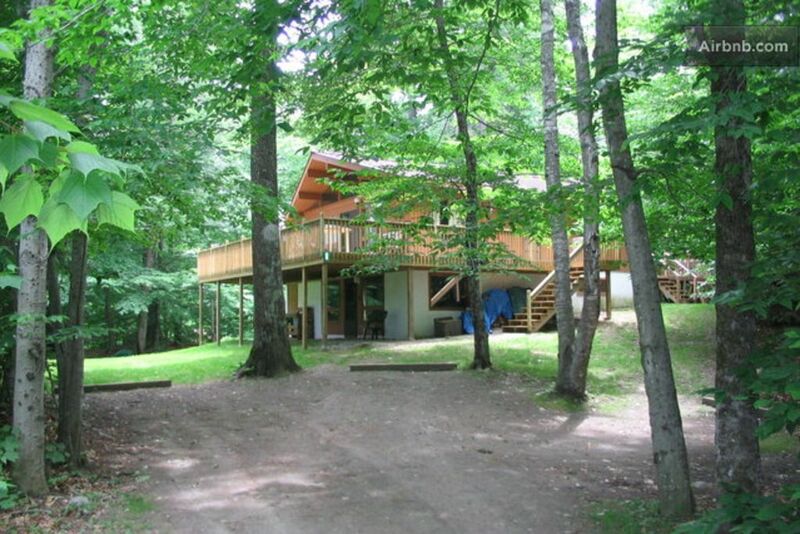 We like its homey, woodsy feel, and the flat yard for volleyball and other fun activities. We love to sit around the fire pit toasting marshmallows at the end of the day. We love that the lake is just a two-minute walk, so we never had to worry about the kids stepping outside and drowning when we weren't looking. We added two huge decks in the front and the back so that we could truly live outdoors. The hot tub feels like a wonderful luxury. We also love the two living areas so that we can send the kids downstairs to watch their movies while the adults hang upstairs sometimes. This house is in the Green Mountains. The lake is across the dirt road. You can see it from the edge of the property. There are trees all around the house blocking the view. Our private dock is a one-minute walk across the dirt road. The lake is across the street, and our private dock is a one-minute walk. One set of sheets per bed, blankets, comforters. Bath towels and washcloths. Bring your own beach towels if you plan to use the hot tub. Plenty for two families. Well stocked! Large decks in front and back of house. patio below front deck. 4 miles to Okemo Mountain Resort. 11 miles to Killington Skyship; 17 miles to main base. Downstairs is ground level, but the bathroom is too small to accommodate a wheelchair and has a bathtub. Okemo is just three miles down the road. Killington Skyeship is 11 miles north. Nearby you can go to the Jackson Gore Spring House and enjoy a health club, racquetball, swimming and more! You'll also find XC skiing, sledding and ice skating nearby. Warm, Inviting Cabin with Lots of Space! A group of 9 of us stayed in February 2019 to ski Okemo for a long weekend. The cabin has a lot of space! The bedrooms are well-sized and the eating and living-room areas are spacious and comfortable. The TVs and fireplaces were lovely as well. The home was very clean and the hot tub was clean, filled, warm and lovely. Going through people's bedrooms to access the tub was a bit different but doable. There is only parking for 5 or 6 cars in the front and we shuffled cars around in order for people to back out of the driveway when they wanted to leave. The driveway and walkway was icy but that's to be expected in Vermont in February. It was great to get an almost immediate response from Lisa when we had a question. Okemo mountain was only minutes away as was the town of Ludlow. The lake was right down the street too. Overall, a great stay and would recommend for a group of friends or families! Repeat stay - just as good as the last time! House is just how we remembered it from out stay last year. Family and dog friendly. Great proximity to the slopes. Hot tub was warm and functional. Great place for a ski weekend with friends and family. Would definitely recommend. We had a great time at the Lake Chalet. It was everything we expected. The house is very close to the ski slopes, has a working hot tub that’s wonderful to sit in after a long day on the slopes, has tons of bedrooms, and privacy from the neighbors. It was a very easy process working with the owner and we had no trouble getting into and shutting down the house. Overall I would highly recommend staying here for a group of friends or a large family looking for a fun weekend in Vermont. Comfortable, Good for big groups, close to everything, hot tub! This house is a great setup for groups or a large family, with two identical floor upstairs and downstairs, and the living room/kitchen area emphasized for space. This leaves the bedrooms a little smaller, but still enough space for your things! I liked that design. The fireplaces were great, and hot tub was awesome! It is certainly one of the best places we've stayed, and seems to be ideal for any season (winter=mountains, summer=on a lake)! There were small annoyances (Hot tub cover was heavy and designed to hang off side of deck, making it tough to lift. And one of the downstairs beds was very cheap and uncomfortable, the rest seemed nice though! ), but nothing serious. The owner is great to work with and is responsive! Jared's group was friendly and easy to communicate with, and they left the house clean and well cared for. Bcause of his comment, we replaced the downstairs mattress and box spring. The hot tub cover has a lift to the side to help with putting it on and taking it off, but I guess he didn't notice it! Nice place that accommodated a large group rather comfortably. Wasn't quite as close to water as we had anticipated (short walk down to the dock). Overall though, certainly satisfied with our stay. Recommended. The house is, as we describe, a two-minute walk to the dock, on a rural dirt road. In a short summary: the pictures on the listing and description of the property are out of date and misleading. Do not expect what you see or read until it is updated to reflect the current condition of the property. In detail: The house is severely outdated, the pictures of the interior and exterior are from when it was first built/redone. The deck is close to falling down, every time we walked it moved and the railings were bowed out bad. There is only one grill, not two as listed. All three sliders are a workout to open and close. There was no wood inside (despite the description) and what was under the tarp was too damp to use. The dock is much further away than it shows/explains in the pictures and was not put into the lake upon arrival despite the owner knowing we were bringing our boat. The property manager did come and put it in, but only after he and the owner made us feel bad as the lake was still chilly. There are ants everywhere! In the beds, all over the house - do not leave any food on the counters, even during dinner as they will run all over it. The smoking policy is a joke as we spent the first hour of our stay cleaning up the property of butts so our pups didn't eat them. If you are planning on a large group, draw straws for the internet as it is very very slow and a younger crowd needing their tech fix will find it super difficult. The only good thing I can say is the kitchens were fully stocked with utensils and cookware which you don't often find in rentals. We tried to express our concerns to the owner during our stay but when she did respond to us, she was hesitant to accept that her cleaning lady, property manager and herself were at fault for any of it. Had we known the shape the house was in, we wouldn't have paid as much as we did. Super disappointed as we have properties of our own and have rented several others and have never had an experience like this nor have our renters with us. Will not stay again. This renter was determined to find everything wrong about the house that she could because when she arrived on Memorial Day weekend, the dock hadn’t been put in the water yet. It was the first time in 16 years, because it had been an unusually cold spring and the water was still icy. Only two homes on the entire lake had their docks in. When she called the property manager, he was very responsive and put the dock in within two hours, despite the frigid water. They also report an ant problem -- we have a regular exterminator, but sometimes in early spring, when nights are cold and days are warm, ants go into the house when they can’t get into their frozen homes. This happens because the house is in the woods and nature happens. Rather than telling staff, this renter chose to suffer silently and then publicly complain later. We sent in the exterminator immediately after seeing this review, and the house is now ant-free. On the internet speed – it’s a rural area, and the Wifi is this limited by infrastructure, but we have changed to a different, faster provider. The deck is not falling apart. It is solidly built. One railing has a little wiggle, but it is not falling off or a danger to anyone – it just leans to the left in one spot We did reinforce it since her visit and have painted it as well. We offered this renter a significant refund and remedied every problem we could, yet she still wasn’t satisfied. Some people never are. We put a lot of time and money into this house and we feel we give families and groups a warm, comfortable vacation. The other reviews reflect this. The house is located on a peninsula with about ten houses. Other Activities: Skiing, ice skating, sledding, snowshoeing in winter. Dock, boats, fishing in spring, summer and fall. Golf: Golf nearby at Okemo, Chester, Springfield, Stratton, Woodstock, Killington and more! There's also mini-golf up the road. Ski: Choose from nine ski areas within 30 miles -- the closest are Okemo, just three miles down the road, and the six-mountain Killington (12 miles to Skyeship) with sister Pico (18 miles). Stratton, Bromley, Magic Mountain, Mount Snow, and others are a stone's throw farther. Prefer cross-country? Step outside onto the frozen-over lake, or drive to some terrific XC areas nearby (Okemo Golf Club, Hawk Mountain Resort, mountain meadows, local parks). You'll also find hunting, snowmobiling, horse-drawn sleigh rides, snowshoeing, and more. Holidays (non-winter) -- Sundays considered weekend nights; $200 surcharge. Weekend rates 12/24 & 25. Pets--$79 CSA travel ins. pmnt. Summer rentals--Sun-Sun. Check-in 4PM; check-out 11AM Linens & bath towels provided. WINTER SEASONAL rental-$16K plus util. Plowing included. No tax. SCAMMER ALERT: DO NOT send wire transfers. Pay thru this website only.